An ETF is an investment vehicle that is structured to enable investors to track a particular index through a single liquid instrument that can be purchased or sold on a stock exchange. An ETF offers the advantages of an investment fund, such as low costs and broad diversiﬁcation together with characteristics more commonly associated with equities, such as access to real time pricing and trading. ETFs generally function as index tracking funds, i.e. they provide their investors with an exposure to the securities in an index, while the listing on an exchange means the ETF shares can be bought and sold by investors on an intra-day basis and using real-time pricing, much like an equity security. An ETF may be established as a UCITS or an AIF. 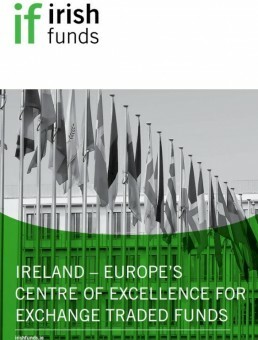 However, most ETFs in Ireland have been set up under the UCITS regime, thereby beneﬁtting from the high level of acceptance of UCITS by regulators and investors worldwide due to the investment rules, investor protections and risk management safeguards provided under the UCITS framework. UCITS III, implemented in 2003, and the Eligible Assets Directive of 2007 provided UCITS with greater investment freedom, including permission to use ﬁnancial derivative instruments and to invest in ﬁnancial indices. UCITS ETFs have benefitted from these additional investment structuring possibilities. ESMA started to review ETF practices in 2010 and subsequently extended its review to cover certain practices within a wider UCITS context. In December 2012 ESMA ofﬁcially published its ﬁnal set of guidelines on ‘ETFs and other UCITS issues’ which took effect on 18 February 2013. ESMA’s guidelines aim to strengthen investor protection, mitigate counterparty risk and harmonise regulatory practices. This is to be achieved through a number of different means, including: increased transparency and disclosure to investors; setting out quantitative and qualitative criteria for collateralised transactions; the wider application of existing UCITS diversiﬁcation limits; and new, stricter criteria in certain cases. ESMA’s guidelines were subsequently revised in August 2014 following the outcome of a consultation on collateral diversification. The revised guidelines provide a derogation from the 20% collateral diversification rule in respect of government securities. In the publications, news and other content on this page you can keep up to date with relevant ETF developments and the work of the Association in this area.